» Is Tsukiji Wholesale Market Open to the Public? Is Tsukiji Wholesale Market Open to the Public? A while back,I picked up a printed Tsukiji Vistor’s Guide in English issued by Tokyo Metropolitan Central Wholesale market at Tsukiji Seimon entrance. After searching for an official site listing the actual rules for visiting Tsukiji and I could not find any, so I went back to the brochure. The brochure brings up some good points that I think visitors should be reminded of. Please do not enter the market before 9:00 am. The Tuna Auction Area is very crowded. We ask you do not visit this area. Stay only in the designated observation area. Use of a camera flash is strictly prohibited as it will disturb the auction process. The printed material lists about seven other restrictions or things to watch out for, such as: slippery floors, not touching any fish or vegetables, the maximum group size is 5, and pets and wheelchair access. 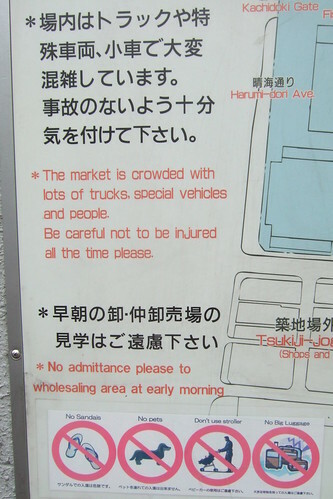 I may sound like I’m overly concerned about safety rules and not disturbing the actual trade taking place at this, the largest market in Japan. I have a good reason, though. If you have been to Tsukiji Market, you know how chaotic it is to navigate through the place, and often, even hazardous. I know a guy who broke his leg in an accident in the market and I got casually punched in stomach one time for being someone’s way. Also, by really learning what the wholesalers think about tourists, I really do want to respect the business people. At the same time, I hope the misconduct of tourists described in this article isn’t going to happen anymore! So, when preparing guests to go to the market, I looked for similar orientation material on the web. I had no luck even on their official site that has a couple of other PDF downloads about the Tokyo Metropolitan Central Wholesale Market in several languages. I contacted the office to ask for the online file location. Long story short, they do not post a visitors guide online because they do not encourage people come to the market. If they set official rules, it would be like saying to the world it is OK to visit Tsukiji Wholesale Market. By keeping rules out of public distribution, other than at the market entrance, they try keep this blurry area as gray as possible. “You are not supposed to go to Tsukiji, but you cannot prohibit Tokyoties from visiting their local market.”, they said. I understand why they are not posting the rules on the web this but is keeping the rules as far away from people as possible really going to prevent visitors entering the market during the peak Tsukiji business hours from wearing sandals or continuously taking flash photos, especially in the summer? I don’t think so. I skipped it. Tokyo’s an amazing city with more to do and see than anyone could fit into a vacation. Not seeing the market was not an issue for me. The vendors said that they wished tourists didn’t come, so I didn’t. I wouldn’t want a bunch of people standing around my office watching me work and getting in my way, either. I totally agree about Tokyo offering so much to see other than the market. I also agree not wanting people getting in the way! After 9 a.m, though, when the main trade is over, you just feel the difference in the air. Also, I love hanging out at Tsukiji Jogai, the food market area next to the wholesale market, to stroll and have morning snacks!